Islamist militants seized foreign nationals Wednesday at an Algerian gas field operated by BP , Norway’s Statoil and Algerian energy company Sonatrach, just days after France launched a military operation in neighboring Mali. The Associated Press reported that at least eight foreigners, including British, Norwegian and Japanese nationals, have been seized at the In Amenas gas field in southern Algeria, according to an unnamed Algerian official based in the south of the country. He said the government is “urgently seeking clarification from oil companies working in the area.” France’s Foreign Ministry is working on confirming reports about the attack, said a spokesman. 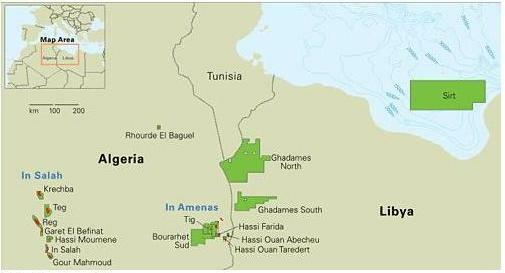 In Amenas is located in the southeast of the country, a few miles from the border with Libya, and harbors nearly 50 crude as well as gas fields, linked to the northern coast through several pipelines. French officials have said that their military intervention in Mali could lead the jihadist movement to target French and European interests. According to the Associated Press, the official said that the attack came at 2 a.m. The Algerian army has since caught up with them and surrounded militants and their hostages, the official said. The official, who spoke on condition of anonymity because he wasn’t authorized to speak to the press, said negotiations between the army and militants were continuing, the AP reported. Algeria’s state news service APS said one person was killed and seven injured in the attack. BP confirmed a “security incident” at the In Amenas gas field. Statoil, which employs fewer than 20 people at the site, 10 of them Norwegian citizens, also said there has been an attack against the gas facility. It said it was in contact with the families of its employees but didn’t elaborate on their situation. A spokesman for Japan’s foreign ministry said it was “aware of the report,” and gathering information. “Considering the nature of the incident, we’d like to refrain from making a comment further,” he said. A Sonatrach spokesman said he was traveling and had no immediate information on the situation in In Amenas. Al Qaida trying to take control of all Northern and Western Africa …. their death-march to ‘the top’ using the odd weirds like Al Shishkabobs has finally drawn responses. They may find that some Africans are educated ….